I love eating breakfast in a warm cozy restraurant. And that's just what we did last Saturday. 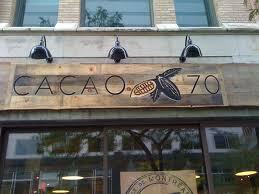 We decided to try a new place so we picked Cacao 70, a relatively new spot on Ste-Catherine between Guy and Atwater. It was a tad funny to be stuck between a korean store and a ghetto bar, but anyhoot...Urbanspoon.ca informed us that 91% of the users liked this chocolaty restaurant so we went for it. We were meeting two of the wife's friends to celebrate her birthday but we ended up being 6 with a baby. The place itself has very high ceilings, and it was nice how vibrant it was with all the hustle and bustle of coffee and hot chocolate (they have over 50 different hot chocolate recipes, including an 'international collection') being made and the waiters/waitresses running about. It was very busy, we got there at around 11:30 am and we were lucky to get a table in this resto that has around 100 seats. It's funny but I got the impression that we were kind of in a farm. Well for one thing, there was hay with cocoa bags put on wooden shelves everywhere. It was movember friendly...:) They had some stashes drawn on a board! Cute! We were seated right at the window so we could see all the french mistakes they made on their window signs. Great! I felt like telling them about it but didn't bother. I'll give them another month to change it or I'm calling the french police :p Loi 101!! So, the menu is huge. No, sorry, it's mother freaking HUGE! On top of it, there are two! The regular menu and the brunch menu. The brunch menu has about 15 items on it so it ain't that bad but the other one, man!!! It has, i'd say, about 100 items, in very tiny writing that only people with 20/20 vision can read. Yep. Anyway, we just had the impression that they were repeating themselves a lot. It's as if they went like: 'how many dishes can we make with spinach? how bout eggs? how bout ham? how bout that God awful sausage(more on that later)? I think it took us at LEAST half an hour to choose what we wanted to order. They did have some crazy good ideas, especially with the chocolate items on the menu. Ze wife took this ke-ra-zy chocolate dish (meant for two) with this ginormous waffle, strawberries, bananas, super thick yummy hot chocolate, chocolate beads, chocolate fondue, and to top it all off, and THIS is the ke-ra-zy part, this tiny burner for your marshmallows!! OH and ice cream with melted chocolate on top. Dsamn! It was excellent! What was cute was that every brunch started with a plate of fruit and melted chocolate. Mmmmm mini fondue! I liked that. I was true to myself and took the piggiest (it's a word, I swear!) on the menu. It was called the Lazy breakfast. The works: eggs, bacon, sausage, ham, potatoes, beans and bread. LOTS of bread. A whole field of wheat in my plate :p i think I had about 6 slices of bread on there. I have to give them props for the presentation! It came in a metal skillet (which kept my food really hot)! I was pleasantly surprised and satisfied. Unfortunately, it was probably the best thing about my meal. The eggs were dry, there were too few beans (and I looooves my beans! ), the ham was meh and the sausage, oh the sausage. I LOVE sausage. OK, stop laughing... I know that sounded weird and stuff since I love me some girl (for the record, the wife does not find this funny... but I am not going to yield! therefore, I'm not taking the sausage joke out :). It was so bad I couldn't eat the whole thing. I can't really explain it. It was even worse than that tiny sausage you get at cheap diners. As for the service, it was OK. The many waiters seemed to always be running around. And when we asked to join tables because we were going to have 2 more people comng and a baby, it was the end of the world. That kind of sucked. Although, I will give it to them; we were 3 at a table waiting for someone else for about 45 minutes without ordering, with people waiting to get seated. Basically, they have good, original ideas but they have to work at it. It doesn't mean your restaurant will be good as soon as you open it: it takes time! I feel so wise. Here's the website! It's very new so it is not complete yet.